Sunday Nite Surreal- Eye of the Devil (1966) The Grapes of Death! 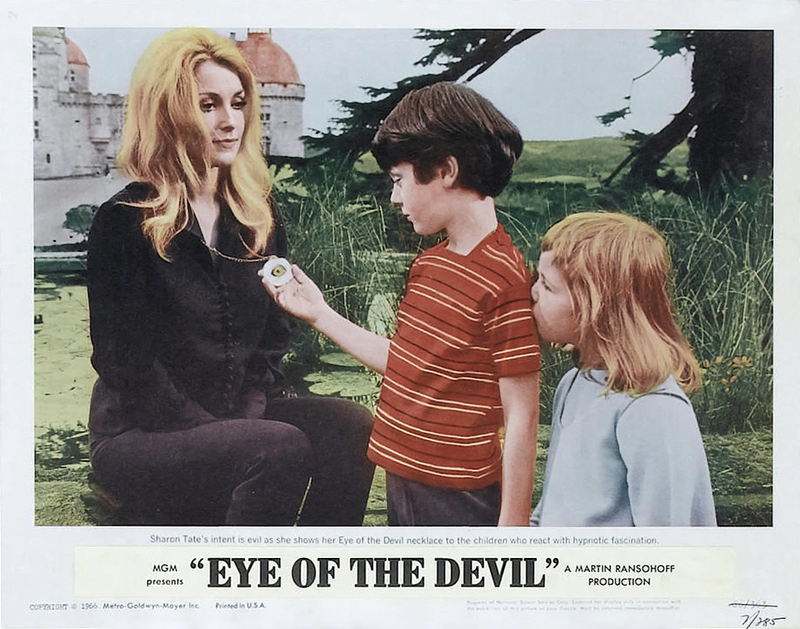 Directed by J. Lee Thompson’s (Blonde Sinner 1956, Tiger Bay 1959, Cape Fear 1962, The Reincarnation of Peter Proud 1975) the outre surreptitious Eye of the Devil (1966) is an atmospheric smorgasbord of uncanny & haunting images encircled by the air of clandestine and provocative underlying forcefulness. With ease the film pulls you into an esoteric world of ancient rites and beliefs and primal fears and urges to prevail against or more aptly in honor of the pagan notion of the rule & reign of the old ways, and the dominant elementals. It’s a bit of a cryptic occult meditation on reverence, immortality, sacrifice and reaping what you sow. Niven urbane and resolute in his stature as Patriarch of the French family who comes home to the ancestral chateau to tend to the vineyards, (the past season’s crop has suffered) and take his rightful place during the rites of the ceremonial harvest. Phillipe must not only observe the deadly family secrets that have survived for centuries but more horrifying than that, it must continue to be passed down to his children. 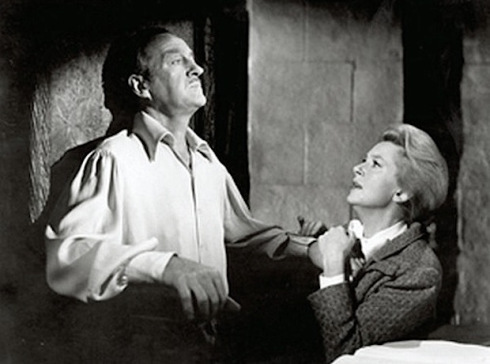 Eye of the Devil, works so well to capture our ideologies by the throat partly because of the convincing performances by the enormously talented cast who inhabit this secret world, Deborah Kerr, David Niven, Flora Robson (Beast in the Cellar 1970 ) as Phillipe’s Great Aunt the Countess Estell, Donald Pleasence as a malefic cleric Pere Dominic with shaved head and solemnity, David Hemmings, Sharon Tate, and Emlyn Williams. 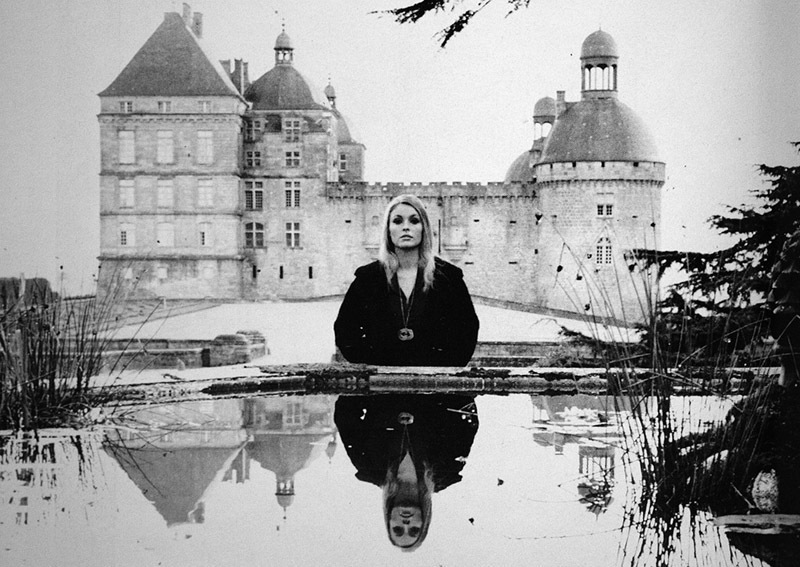 Both Sharon Tate and David Hemmings play two beautiful yet sinister figures lurking about. 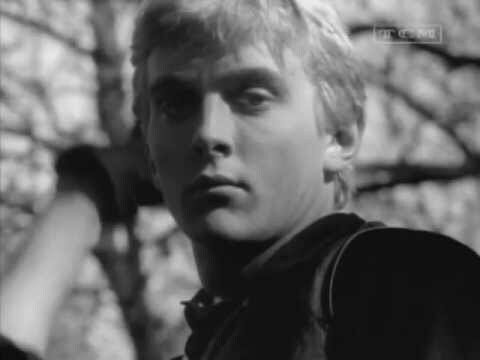 David Hemmings went on to do Michelangelo Antonioni‘s Blow Up (1966) and Sharon Tate whose first movie this was, went on to do Roman Polanski’s originally called Dance with The Vampires, now called The Fearless Vampire Killers, a comedic romp through the classical vampire story, though a little numb possessed a few hilarious moments. Erwin Hillier combined with J. Lee Thompson’s directing style is tense and well focused gaze creating a closed world of authentic dis-ease. Beautifully photographed with slight suggestions of The Wicker Man. There is an intoxicating ambiance perfectly underscored by the simplistic yet alluring music by composer Gary McFarland. Hillier’s close ups capture fertile images of evil & arcane sensuality. 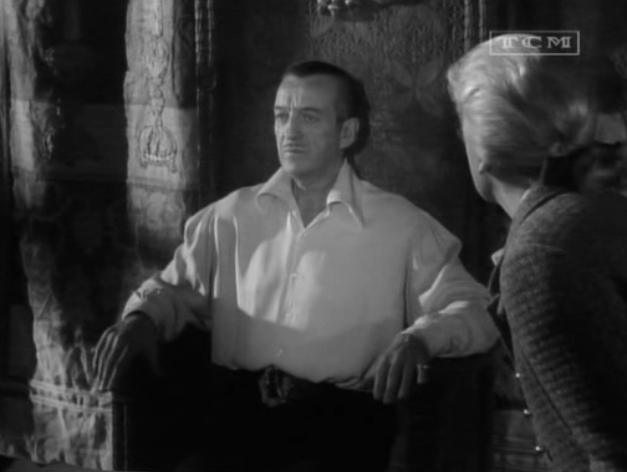 David Niven is the marquis Philippe de Montfaucon who is the owner of a historic Vineyard. When a dry season hits the harvest he is summoned to the castle Bellenac. Deborah Kerr plays his wife-Catherine de Montfaucon who is told to remain in Paris with the children, but she follows him anyway. And for her troubled she is assailed in the woods by very ominous figures in hoods which makes for a very potent scene… which does not cease even up to the end’s shocking climactic conclusion. The opening frames are quick cuts which utilize the sound of a speeding train, cut away frames between reveal shots of a sharp arrow, we hear the train sirens, a lavish cocktail party in high society, an old world looking bearded man on the train, the arrow is raised- it pierces the heart of a white dove, the woods are filled with hazy black hooded figures, eerie and ominous they stand by the trees. A cross of branches is set on fire. Close up on Sharon Tate then close up on Hemmings then the screen goes black and the credits roll…..
It’s a post modern and riveting way to open a film about an esoteric narrative …the film’s title is set against the speeding train it’s windows like eyes themselves staring back at us. When Phillippe the Marquis arrive in Bellenac the villagers all seem to revere him, lifted their hats to him, heads downward, humbled and proud. 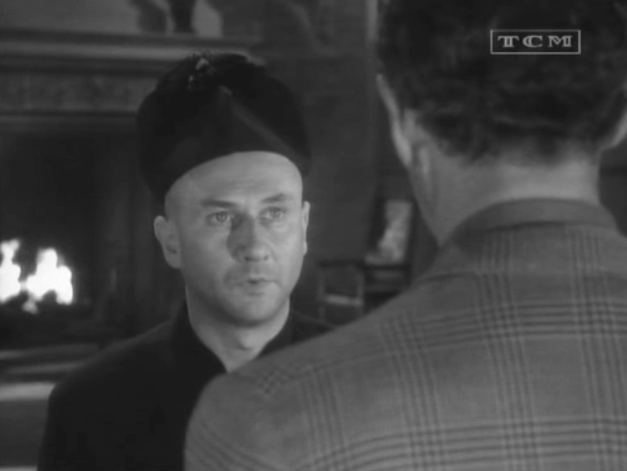 He meets up with the cleric Pere Dominic (Donald Pleasence) the mood and furnishings give one the idea of an Orthodox Christian sect. Some thought he would not return to Bellenac the butler knew he would return… Phillippe asks how about you father? Family friend Jean-Claude Ibert (Edward Mulhare) sits by the fireplace in Paris talking about Phillippe’s trip back to Bellenac. Catherine tells him the first time she was there after their wedding she says it was the most frightening place almost as though they were back in the Middle Ages. Jean-Claude tells her that Phillippe had always been obsessed with the place as if he was trying to solve it’s diabolical secret. Once at the castle Philippe seems distant as if he is following a mysterious compulsion guided by the pervading force of a cult that recognizes ancient pagan rituals, and perhaps sacrificing his own life in order to save the vineyard. Catherine can do nothing to change her somnolent husband’s mind to leave and come back with her and the children to Paris. 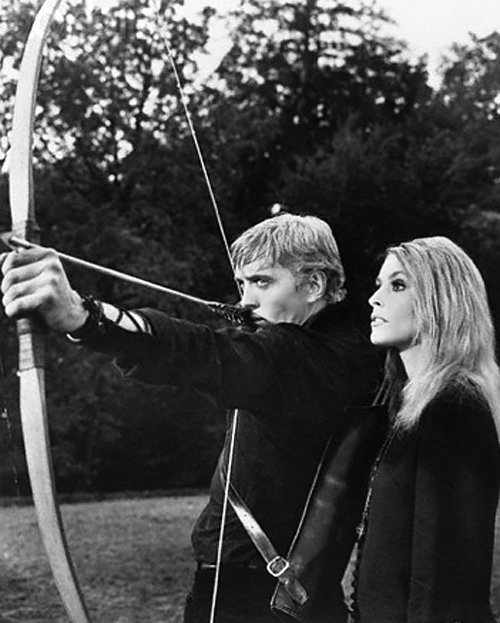 Both Sharon Tate as the luminous Odile de Caray and David Hemmings as the impish Christian de Caray play two beautiful yet other-worldy and sinister figures lurking about with bow and arrows. Turning toads into doves, and is fixated on the children. Odile mesmerizes both Jacques and Antoinette She asks if they believe in magic, then she demonstrates her powers by changing a frog on a lily pad into a dove. Could she be using the art of hypnosis to create an illusion? Catherine does not want her brother Christian killing anymore doves on the property and isn’t happy to see her influence over her children. It begins to rain. But Odile tells her that they are not life giving clouds and that it will pass quickly. Catherine asks why she is at Bellenac. Odile tells her that she and her brother come there often… Then Christian appears and shoots an arrow into a tree right next to Catherine. The siblings wander through the landscape like other-worldly minions. Phillippe begins to pull away consciously from his wife and children, he tells her to take them and leave. She pleads with him to come home with her and that she can help him. In a sense it’s all begun and even if she tries to make a fuss afterwards, no one will either believe her or come forward to help her. She says he must be mad, that he’s dying for nothing, walk away from this stupid evil. Originally Kim Novak was cast in the role of Catherine de Montfaucon. 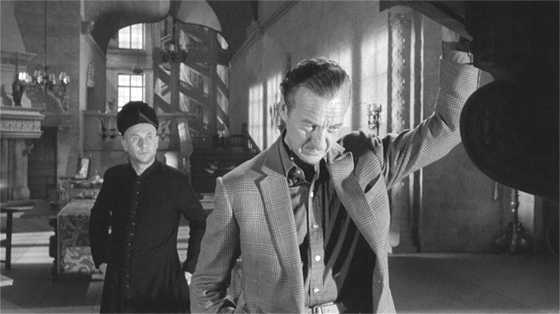 Filming began in the fall of 1965 in France. Near every scene had been filmed when Kim Novak fell from a horse and wasn’t able to complete her scenes. 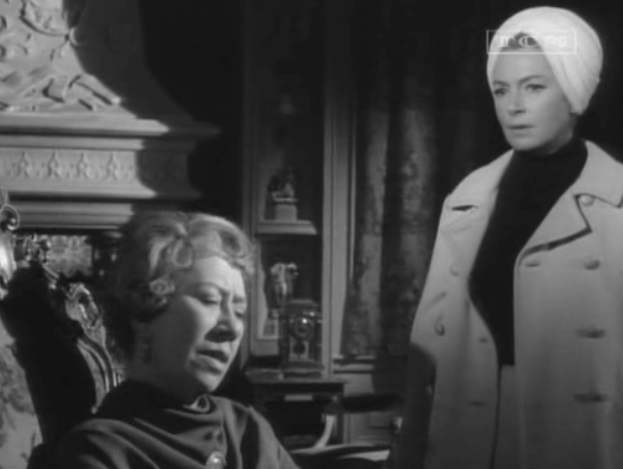 Deborah Kerr was hired to take over and every scene that featured Miss Novak had to be re-shot with her replacement. HAVE A SO-REAL SUNDAY NITE- FROM YOUR EVERLOVIN’ MONSTERGIRL! I don’t think it needed to. I think it was more about the family falling apart than anything. But it would have been nice if it did.